If you’ve been paying attention to compression gear for the past decade, you’ve probably heard of Tommie Copper. They’re one of the most prolific brands of compression technology and are a niche industry leader in copper-infused fabrics. Tommie Copper was founded in 2010. The company’s goal is to help people live healthier, more active lives. While other brands of compression gear focus on increasing performance, Tommie Copper’s mission is more accurately described as the promotion of comfort and general quality of life improvement. If you’re interested in learning more about Tommie Copper’s products, you’ve come to the right place! In this review, we’ll do some Tommie Copper reviews and tell you about their specs, key features, and pros and cons. At the end, you should have a good idea about whether any of Tommie Copper’s products are right for you. Enjoy! Tommie Copper is notable among compression lines for their copper-and zinc-infused products. According to the company, their patent-pending fabric is naturally odor-resistant and antimicrobial by virtue of its metal content. Some people also believe that copper has healing properties that enable faster tissue repair and diminished soreness. This information is not mentioned by Tommie Copper’s website, which leads me to believe this might be more myth than fact. Nevertheless, it is a commonly held belief that seems reasonable to address. If you buy Tommie Copper products from a source other than the manufacturer, you might hear some claims about the benefits of copper. I can’t say whether or not there’s any validity to these claims, so put as much stock into them as you feel is appropriate. Now that that’s out of the way, let’s talk about some Tommie Copper products! The first thing we’ll do is a Tommie Copper sleeve review. Tommie Copper stresses that it’s products are for everyday use, not just for athletes who train daily. This recovery leg sleeve is created with that in mind. 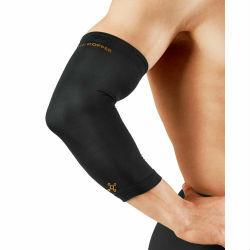 Anyone with knee or ligament pains should consider wearing a knee sleeve. The right amount of compression can offer support to the joints and muscles that makes the difference between constant pain and comfort, which, during a workout can mean the difference between keeping up and packing it in. These sleeves are made of a combination of copper polyester and spandex. They provide UPF 50 protection, which makes them great for working out outdoors in the sun. 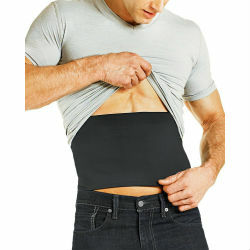 This sleeve is thin enough that it could also be worn under pants for unseen knee support during daily life. The knee sleeves come in silicone and non-silicone variants. The models containing silicone are more resilient and more likely to stay up without a fuss. One last thing about this product: it doesn’t really provide all that much compression. If you’re looking for something that does, you might want to try a different brand. The elbow is one of the most commonly injured joints in the human body, making a little extra support ideal for preventing and recovering from injury. Perhaps for this reason, the elbow sleeve is one of Tommie Copper’s most popular products. Golfers, tennis players, baseball players, bowlers, basketball players and more can benefit from this device. This elbow sleeve is supportive enough to be worn while playing sports, yet thin enough to be worn under a dress shirt, reflecting the company’s commitment to daily life and training. Men’s sizing ranges from small (8 to 10 inches around your bicep) to 6XL (24.5 to 26 inches around your bicep). Elbow sleeves run a bit tight, so you may want to err one size higher than you think you need–just in case! If you have arthritis, you know that it can be hard to maintain a steady grip on things for even a moderate amount of time. Tommie Copper reviews for arthritis sufferers are solid: a tribute to the help these gloves can provide. These gloves can be a huge help in that regard in two ways: First, the palms of the gloves are made of silicone and provide extra gripping strength to the wearer. Second, the gloves are made to compress the muscles in the hand, providing the same kind of relief from soreness that compression shorts or sleeves do, and allowing the wearer to use a stronger grip than would normally be possible. Unlike other gloves that fully cover the fingers, half-fingered gloves allow you to maintain a high level of dexterity while keeping your hands and fingers warm. If you have a job that involves fine motor skills or typing, that can be a huge plus. Anyone from carpenters to secretaries should look into a pair of these if they’re having trouble with arthritis or carpal tunnel. This is something of an unusual product, though it’s not dissimilar to a weightlifting belt–at least in terms of intended function. The idea is that the core band compresses the lower back muscles, helping to prevent injury and, ideally, let you lift more weight safely. 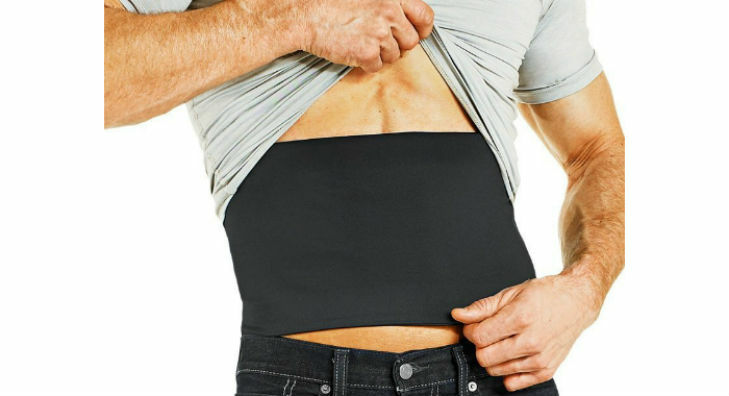 Unlike a weightlifting belt, which is composed of sturdy, rigid material and locks your back into a certain position, this product is a lot more forgiving. On the one hand, that’s good: it means it can be worn casually, under clothes, and doesn’t make you walk around like Frankenstein. On the other hand, if you’re looking for serious lumbar support, don’t turn to a product like this. A spandex band around your waist might be helpful and even provide some guidance during a lift, but it’s not going to keep your back safe if you’re lifting pianos or anything like that. One thing to keep in mind about the core band is that it tends to run a bit small. Considering how it’s meant to be worn, that can be a little awkward or even irritating if you’re on the larger side. I’d recommend either buying a size up or making very certain that you buy the correct size according to the sizing chart. Let’s be honest: one of the drags about all this compression gear is that taking it off can be a real nuisance–I mean, they’re designed to be tight and stay in place, after all. So, while it’s nice that compression shorts keep everything in place while you’re running, it can be a little inconvenient when nature calls. To that end, one of the unique and useful things about these compression shorts is that they come with a fly. Even though your gym shorts almost certainly don’t have one, it’s the closest thing to convenience we can expect from workout gear. Anyway, these shorts are great for running, working out at the gym, or playing sports of all kinds. They offer support and comfort, along with the other benefits associated with compression wear (increased blood flow, quicker muscle recovery time, etc). Remember the antibacterial properties of copper-infused fabric we were talking about earlier? Well you’ll be glad for that when you wear these shorts. Creating an inhospitable environment for bacteria means these shorts don’t start to smell as fast as others would. Additionally, their ability to wick sweat away from the skin furthers their resistance to odor buildup. Don’t get sweaty and gross…at least not as fast as other compression shorts! Tommie Copper products are pretty middling; they aren’t the highest quality by any means, but their prices aren’t exactly outrageous, either. At the end of the day, it really comes down to what you’re looking for in a compression product. If you’re looking for something highly durable and supportive, Tommie Copper probably isn’t the company for you. One of the most consistent complaints against their products is that they don’t hold up well to wear and tear. On the other hand, if you’re looking for something that will help you get through your normal day, relieve some pain and provide support during the process, you might very well want to give Tommie Copper a try. I hope you’ve enjoyed this Tommie Copper compression wear review!